Drive the bottom line…and take the higher road. As a student in Boler, it’s a given that we’ll help you map out and execute an academic plan so that you’ll graduate with the skills and experience to change the world. Our location in Cleveland means that you’ll have access to alumni and internships throughout the city at places such as PricewaterhouseCoopers, the Cleveland Clinic, and Akron-based Goodyear. And these internships often lead to jobs. But as a Jesuit liberal arts business school, we believe there’s more to life than getting a good job and driving the bottom line. Living an inspired life is about developing the intellect, character, and leadership skills that create and maintain an inspired business life. Doing things right is about learned skills. To be a fearless problem solver, you need character, leadership and an ability to serve others. Learn more about our high-ranked Accountancy Program. No matter where technology or industry goes, you’ll be ready to adapt and lead change. Can technology and big data make the world a better place? It may bring greater safety, health, convenience, and economic opportunity, yet it may also be used to produce inequality, discrimination, and violations of privacy. As a computer science, health information technology, or data science major you’ll have plenty of opportunities to gain real-world experience at Fortune 500 companies as well as at start-ups and the Cleveland Clinic. But you’ll also explore the complex relationships between data, technology, and society. Direct Care, Research, Health Professions – When you are called to serve others, there is no better place to be than on a Jesuit campus, and in a thriving healthcare center. At JCU, you’re learning in the heart of the nation’s top healthcare region, with access to internships, research and alumni connections needed to guide your career. You’ll also develop the intellect, character and leadership principles needed to inform and guide the scientific skills you acquire. That’s the Ignatian tradition at the core of the JCU experience. To succeed in the 21st Century economy, you need a nimble intellect and sharp communication skills. The humanities programs at John Carroll will develop a deep understanding of the complexities of the human experience. It’s all about becoming a great employee … and a great human being. While academic programs in entrepreneurship were once exclusively business focused, John Carroll looks at entrepreneurship as a way of thinking and developing an entrepreneurial mindset, with a focus on teaching students to recognize opportunities in both for-profit and non-profit organizations. In addition to a minor that is available to any major, the Center offers programs such as the Student Hatchery, a unique opportunity to bring your idea to market; the ideaLab and Soper Prize, idea contests open to all undergraduate students in all majors. A degree in psychology is the key to a purposeful life – leading you to medical school, law school, careers in business, scientific research, counseling and more. 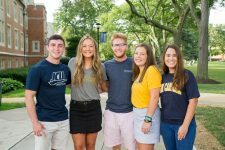 At JCU, our students learn to make connections. Not just connections between people. But also between the brain and the body, between individuals and their surroundings, and between research and the real world. We help you unlock and understand these pathways and help you see how psychology and science can make the world a better place. The Mike Cleary Program in Sports Studies focuses on planning, implementation and leadership across a wide diversity of athletic-related careers. We connect students with job shadowing and internship experiences in college and professional sports management, coaching, recreation, administration, and more. Majors in exercise science focus on developing knowledge of human movement and behavior as preparation for graduate school and career opportunities such as fitness, wellness, athletic training, physical therapy, and nursing. John Carroll alumni provide a national network that opens doors for current students. Many of our alumni are in administrative and coaching positions throughout the NFL, MLB, and the NCAA. Most college graduates expect to make an impact on the world. John Carroll students in the social sciences, education, or global studies know that structures of society also impact people. They know that the design of classrooms, communities, and corporations can hold us back or help us thrive. JCU graduates cultivate a passion for social change and seek to improve the physical, cultural, and social conditions of people locally and globally. Innovation in science, technology, engineering and mathematics lead to the new products and discoveries that drive our 21st Century lives. You need a passion for creativity and a rigorous approach to research in order to have the scientific literacy that will be in demand throughout your career. STEM graduates at John Carroll see new worlds of possibility…and bring them into being.